Lock in a great price for Holiday Inn Express Hotel & Suites Silt - Rifle – rated 8.9 by recent guests! Room with balcony that over looks the Colorado river. Location, laundry, staff was very friendly and helpful, wonderful lobby and dining area, view of the Colorado River. Friendly staff, great location, nice view of the river! Breakfast! View of the River, outdoor sitting area. Close proximity to town. We loved our room on the Colorado river! The staff was very friendly and accommodating! The friendliness of the staff was excellent and as anticipated the room was clean and comfortable. As an added bonus, we had a lovely view of the Colorado River just outside the window. Great location. Nice area by the river. Rooms clean and staff great. Would recommend this hotel. The hotel is easy to access, and check-in is easy and fast. The room was clean and comfortable. There was an extensive breakfast which looked wonderful--eggs and sausage, biscuits and gravy, pastries, cereal, even a veggie egg white omelet. I am on a diet so was unable to eat any, but my husband enjoyed what he ate. The coffee was pretty good; definitely above the average hotel coffee. Quiet and clean room. Good breakfast. Friendly staff. Great view. Love the staff and location. Location is pretty awesome. The view was amazing. Holiday Inn Express Hotel & Suites Silt - Rifle This rating is a reflection of how the property compares to the industry standard when it comes to price, facilities and services available. It's based on a self-evaluation by the property. Use this rating to help choose your stay! Offering views of the Colorado River, this hotel is less than 1 miles from Silt Historical Park. It features an indoor heated pool, a 24-hour gym and rooms with cable TV. 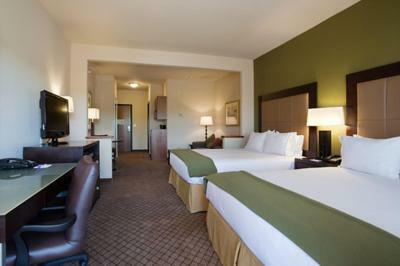 Spacious rooms at the Holiday Inn Express Hotel & Suites Silt – Rifle provide flat-screen TVs and dark wood furniture. Each air-conditioned room includes a microwave, a refrigerator and coffee facilities. Guests can relax in the jacuzzi or work in the business center at the hotel. Silt Holiday Inn Express Hotel & Suites offers barbecue facilities and on-site laundry facilities for guests’ use. Glenwood Caverns Adventure Park is 16.8 miles from the hotel. Guests are 19.5 miles from the Glenwood Hot Springs. This property also has one of the top-rated locations in Silt! Guests are happier about it compared to other properties in the area. This property is also rated for the best value in Silt! Guests are getting more for their money when compared to other properties in this city. When would you like to stay at Holiday Inn Express Hotel & Suites Silt - Rifle? This air-conditioned room features a flat-screen cable TV, a microwave, a small refrigerator, tea and coffee-making facilities and an private bathroom. Spacious room provides a seating area with sofa bed. Features a private balcony with views of the Colorado River and a seating area with sofa bed. House Rules Holiday Inn Express Hotel & Suites Silt - Rifle takes special requests – add in the next step! Holiday Inn Express Hotel &amp; Suites Silt - Rifle accepts these cards and reserves the right to temporarily hold an amount prior to arrival. Holiday Inn Express Hotel & Suites Silt - Rifle accepts these cards and reserves the right to temporarily hold an amount prior to arrival. Love this location, the staff are great! Need electrical outlets on nightstands. A little dark in room. Quiet and loved the beds and shower. Lobby bathroom was very dirty near swimming pool. Front staff in afternoon arrival was great. River front rooms with balcony make this place. Windows needed to be cleaner to view the beauty.. Excellent service and comfort! Worth every penny paid :) Thank you! The shower handle was confusing between cold and hot water. The choice of eating establishments could be a problem, but we found an excellent pizza establishment nearby. As a minor problem, there was no half and half in the breakfast room. Nice room...good size with comfortable bed. Breakfast was also good for couple of days we stayed. Only thing its a new hotel with no other things around..but overall good place to see neary locations.